TORONTO, ONTARIO, December 18, 2017 – Experience the bold elegance of a progressive and luxurious Lexus RX mid-size SUV. For 2018, Lexus offers a choice of traditional gasoline or advanced gas-electric hybrid powertrains and a total of 9 model and trim combinations – including a new Navigation Package for the RX 350 and a number of performance-oriented F SPORT editions. Curbside, every feature on the 2018 Lexus RX is chiselled and sharpened to enhance its road stature and aura of rock-solid stability. A precisely honed character line runs from front to rear, creating an arrow-like profile. The flowing roofline minimizes drag, reduces noise, and enhances stability at high speeds. The RX sports a large, bold iteration of the signature Lexus spindle grille, plus a blacked-out C-pillar that makes is appear as if the roof if floating on air. Stylish L-shaped LED headlamps and fog lamps frame the front grille, while wide, L-shaped wrap-around LED brake lamps impart an authoritative presence. Other exterior features of note include alloy wheels, power-adjustable and heated mirrors with integrated signal lamps, aluminum roof rails, a power moon roof, a roof-mounted rear spoiler, and more. Grab the touch-sensitive door handles and the RX automatically unlocks, welcoming driver and passengers to an interior that immerses occupants in sublime comfort and superb craftsmanship. The hand-stitched leather dash, perforated leather seat surfaces, heated steering wheel and shift knob, and wood interior trim convey luxury and elegance. With room for five adults, all seats are heated, while front seats are also ventilated. Meantime, the dual-zone automatic climate control system ensures year-round comfort. Front seats are eight-way power adjustable and include a driver’s seat memory system linked to steering column and exterior mirrors, while the split folding rear seats also recline for additional comfort. A remote release in the cargo area makes it easy to stow the rear seats to more than double the available cargo space, to 1,579 litres (55.8 cubic feet). Other interior features of note include power windows with auto up/down function on all windows, aluminum scuff plates, a power back door with jam protection, the Smart Key System with Push Button Start, four 12v accessory power outlets for personal electronics, the signature Lexus analogue clock, and more. The RX 350 features a 3.5 litre V6 that delivers up to 295 horsepower and up to 268 lb-ft of torque. This is mated to a sequential shift mode 8-speed automatic with lock-up torque converter and transmission cooler. Regardless of powertrain, all 2018 RX series models feature the Lexus Drive Mode Select system. This delivers improved acceleration and steering performance with three distinct drive modes – Eco, Normal, and Sport S – to match the driver’s mood and the road conditions. Hybrid models may also be operated in electric-only EV mode for short distances. A nimble ride and agile handling have always been a hallmark of the Lexus RX. With a fortified chassis, the 2018 RX delivers exceptional straight-line stability and turning control, while the robust body structure enhances handling response and reduces in-cabin noise. All RX models feature Active Torque All-Wheel-Drive, which provides superior traction performance while efficiently distributing torque between the front and rear wheels. The result is superior driving confidence in all weather and road conditions, plus enhanced fuel efficiency. The 2018 RX series also features impressive safety performance. All models are standard equipped with Lexus Safety System +, including the pre-collision system with pedestrian detection, automatic high beam, dynamic radar cruise control, and lane departure alert with lane keep assist. Other safety features include the Blind Spot Monitor and Rear Cross Traffic Alert systems, a back-up camera with back guide monitor, 10 airbags, ABS with brake assist and electronic brakeforce distribution, a direct tire pressure monitoring system, an onboard first aid kit, and more. New for 2018, the 2018 Lexus RX 350 with Navigation Package (Starting MSRP: $57,850) adds a voice-activated navigation system with Lexus Remote Touch interface. The 2018 Lexus RX 350 with Luxury Package (Starting MSRP: $64,100) adds numerous technology features, including a voice-activated navigation system with Lexus Remote Touch interface, a 12.3” display screen for the audio system, intelligent clearance sonar with rear cross traffic brake, and an auto recirculation feature to the climate control system. Luxury and comfort upgrades include premium leather seating, wood grain and leather-wrapped steering wheel, additional adjustments to the powered front seats, 20” alloy wheels, a rear door sunshade, front illuminated LED door scuff plates, L-shaped premium LED headlights, cornering lamps, and premium LED rear combination lamps. The 2018 Lexus RX 350 with Executive Package (Starting MSRP: $69,750) adds all the items in the Luxury Package plus a head-up display, a panoramic glass roof, the panoramic view monitor, a touch-free power back door, a 15-speaker Mark Levinson audio system, a wireless charger for compatible personal electronics and power rear folding seats. The 2018 Lexus RX 350 F SPORT Series 2 (Starting MSRP: $65,200) adds numerous technology features, including the Adaptive Variable Suspension system, the SPORT S+ setting on the Drive Mode Select system, a voice-activated navigation system with Lexus Remote Touch interface, a 12.3” display screen for the audio system, intelligent clearance sonar with rear cross traffic brake, and an auto recirculation feature to the climate control system. Unique F SPORT features include 20” alloy wheels, F SPORT seating with leather surfaces, F SPORT leather-wrapped steering wheel with paddle shifters and shift knob, mesh F SPORT front grille, F SPORT scuff plates, F SPORT meter, aluminum sport pedals with rubber inserts, and more. The 2018 Lexus RX 350 F SPORT Series 3 (Starting MSRP: $69,750) builds on the Series 2 upgrade, adding a head-up display, a panoramic glass roof, the panoramic view monitor, a touch-free power back door, a 15-speaker Mark Levinson audio system, a wireless charger for compatible personal electronics and power rear folding seats. The 2018 Lexus RX 450h with Executive Package (Starting MSRP: $76,600) adds a head-up display, a panoramic glass roof, the panoramic view monitor, a touch-free power back door, a 15-speaker Mark Levinson audio system, a wireless charger for compatible personal electronics and power rear folding seats. 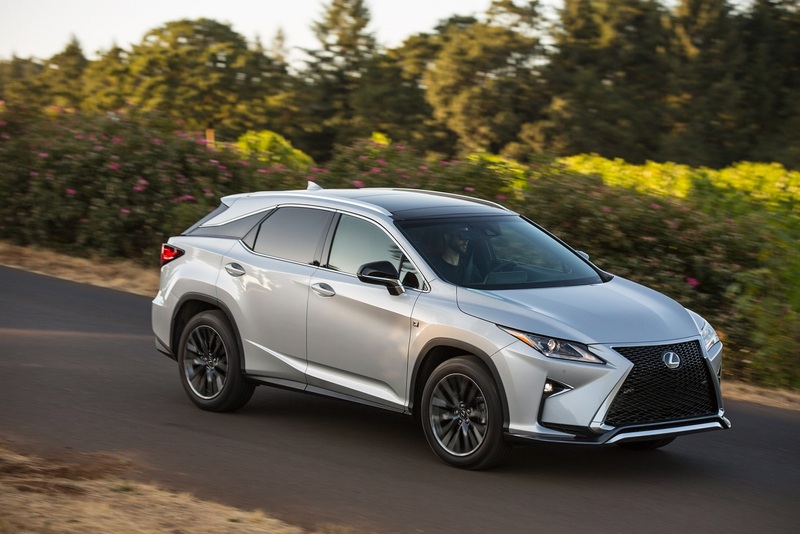 The 2018 Lexus RX 450h F SPORT Series 3 (Starting MSRP: $76,800) adds the Adaptive Variable Suspension System, the SPORT S+ setting on the Drive Mode Select system, and a head-up display. Unique F SPORT features include 20” alloy wheels, F SPORT seating with natural leather surfaces, F SPORT leather-wrapped steering wheel with paddle shifters and shift knob, mesh F SPORT front grille, F SPORT scuff plates, F SPORT meter, aluminum sport pedals with rubber inserts, and more. Other features in this upgrade include a panoramic glass roof, the panoramic view monitor, a touch-free power back door, a 15-speaker Mark Levinson audio system, a wireless charger for compatible personal electronics and power rear folding seats. The 2018 Lexus RX series is now on sale at Lexus Dealers across Canada. For complete and up to date details and specifications, visit www.lexus.ca/rx.